Amanda was 24 when she was registered blind. Twenty years later she experienced profound and sudden-onset hearing loss on one side. At the time she was a member of the Blind Foundation and of Blind Citizens New Zealand. She became a committee member of the Nelson Branch of Blind Citizens NZ, was Chair 2015-17, and remains active on that committee. Inspired by the need for advocacy and in support of self-determination for deafblind, blind, and vision-impaired persons, she served on the Blind Citizens NZ Board 2013-17. David Wilson, Chair of Deafblind Association NZ, is one of those people. 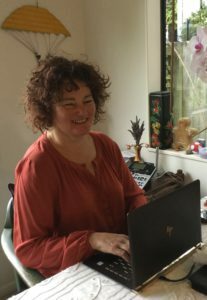 Amanda accepted his invitation to work towards forming an organization that would support communication of deafblind and their participation in all aspects of Aotearoa New Zealand life. Lloyd Ellison, Blind Foundation, supported this with compassion, insight, and professional savvy, and has Amanda’s thanks.